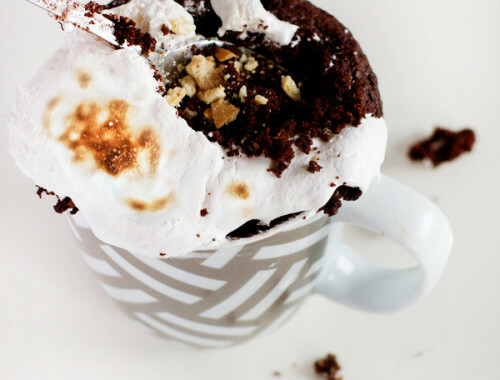 This recipe is certainly quite a mouthful in more ways than one! I was gifted a lovely glass pie dish from Pyrex to celebrate their 100 year anniversary and I started out trying to make a simple peanut butter pie. But as always, I had to put my own spin on things! We don’t have graham crackers in Australia, so I substituted them for a combination of arrowroot biscuits and pretzels for the crust. I kept the filling simple – it’s just cream cheese, peanut butter and a bit of sugar. Heaven. And finally, most peanut butter pies were topped with Cool Whip, another product we don’t have in Australia (but why would you use imitation whipped cream instead of the real deal? I’ve love to know!) so I omitted the cream topping and simply finished it off with a drizzle of dark chocolate and some crumbled pretzels. Blitz biscuits and pretzels in the food processor until finely crushed. Add in melted butter and pulse until just combined. 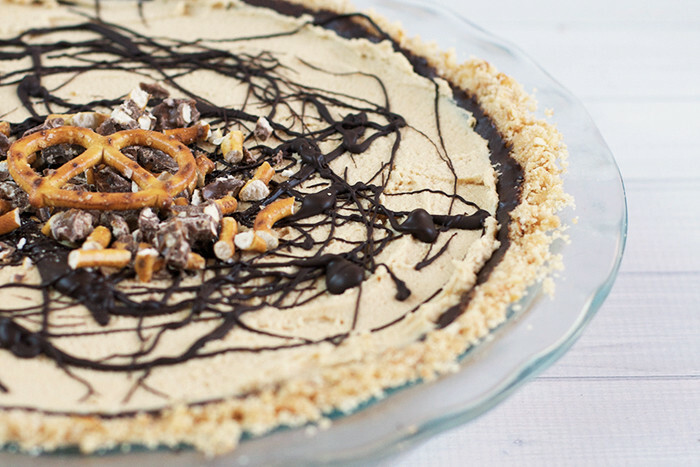 Press the biscuit mixture into a 24cm/9.5″ pie dish and put in the fridge to set. Pour the ganache on top of the set pie crust, gently coaxing the chocolate mixture up the sides of the crust. Return to fridge to set. Place the cream cheese and sugar in a large mixing bowl and beat until smooth. Add in the peanut butter and keep beating until smooth and creamy. Pour onto pie crust and put in the fridge to set for at least 2 hours. Melt the dark chocolate in the microwave in 30 second bursts until smooth and glossy. 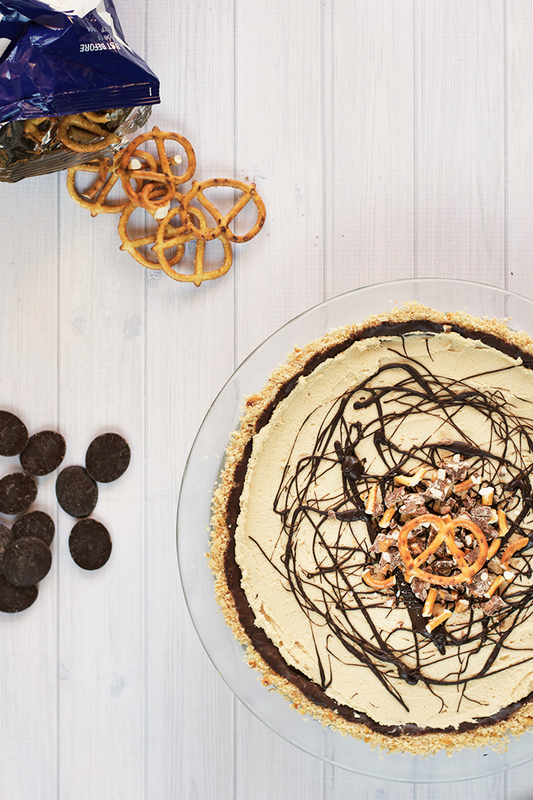 Drizzle the chocolate over the top of the pie and crumble over a few pretzels. Top with a final pretzel and enjoy! 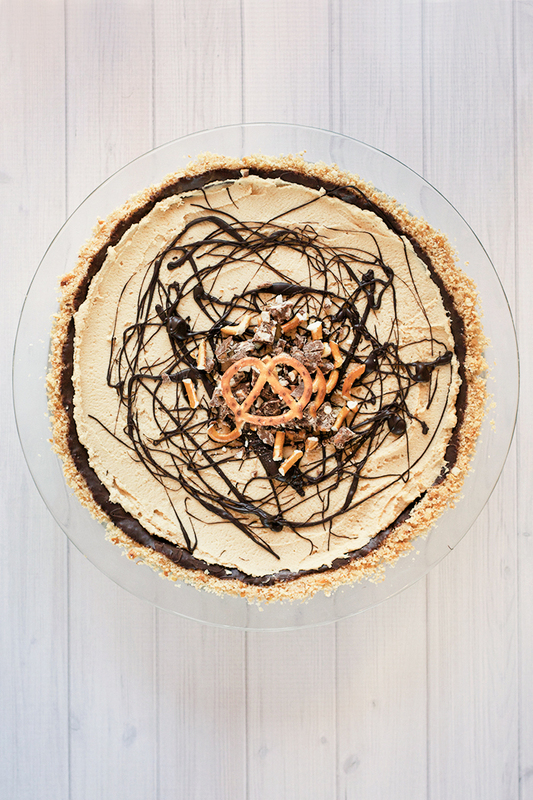 So how was my bastardisation of the humble American peanut butter pie? Pretty damn delicious, if I do say so myself! This is a seriously rich pie, but it’s given balance by the omission of the whipped cream layer and the addition of the salty pretzels. This is truly heaven on a plate. And finally… Waka waka waka. 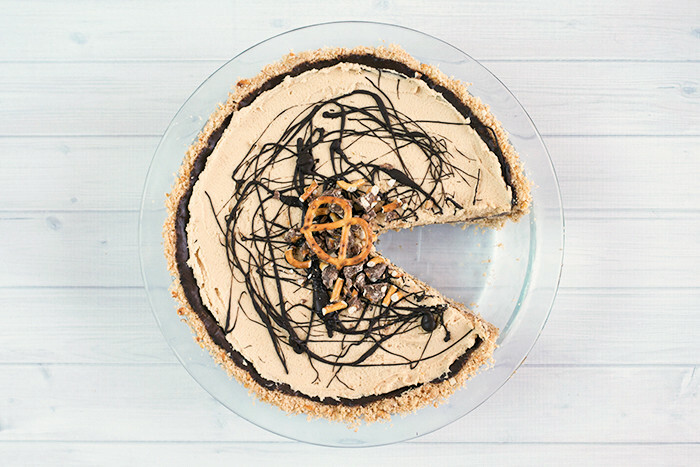 Sorry, I forever have to turn pies into Pacman characters. Hah! What’s your favourite American dessert? What would you like to see me try next? 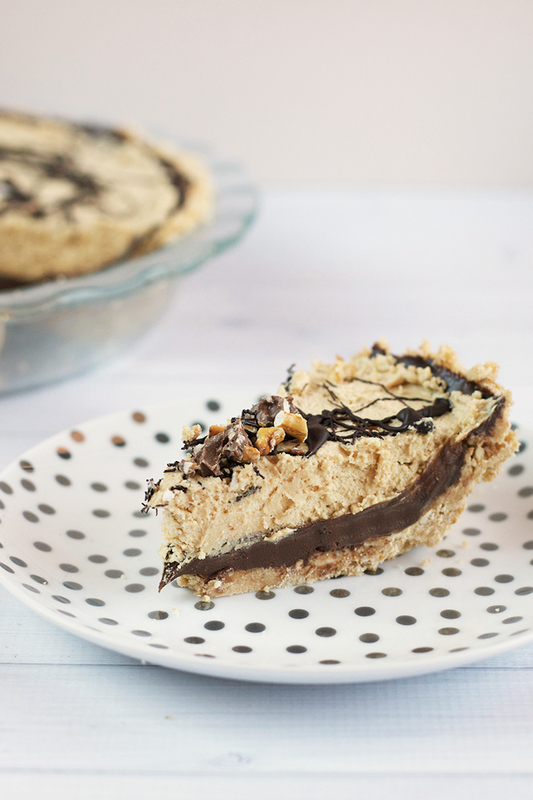 I’ve never tried an American peanut butter pie but I have a feeling your Aussie version tastes even better. I could look at these pics forever, it looks soooooooooo good. This looks magical! 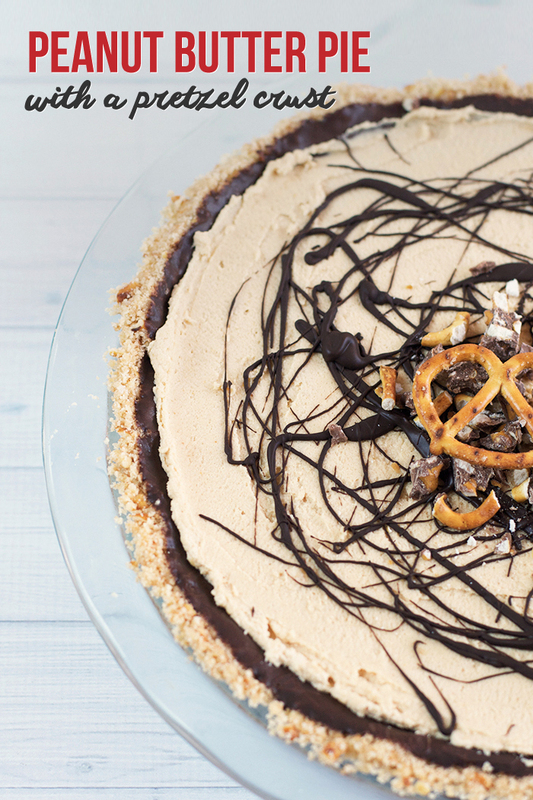 I love the idea of a black bottom pie – all my favourite things in one tasty treat! I’ve never made a black bottom pie before but had seem them a lot on Pinterest. It’s a great (and tasty) idea! Oh my! Pretzels in with the biscuits – genius! And I would never so no to dark chocolate ganache!!! I am obsessed with added pretzels to my biscuit bases, the added salty crunch is heaven! Just at a time where I am craving something sweet and delicious! This recipe sounds so delicious. 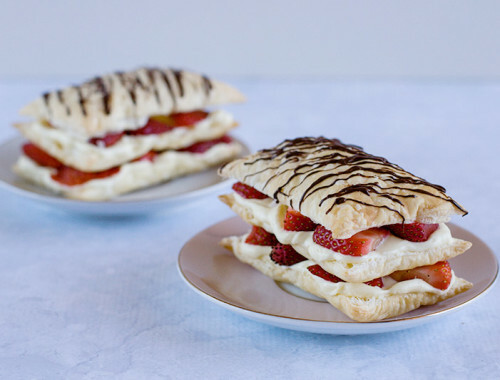 Definitely is on top of my list of recipes to try. Thank you for sharing such great ideas. You are very welcome Anne, glad you love it! Sounds scrumptious & very creative! The chocolate base would stop your biscuit/pretzel base getting soggy as well as being a delicious addition. I’ve used this base/lining in fresh fruit pies for the same reason.